Bolivian Thoughts opinion: It is absolutely refreshing to see that Spain continues to give support to our country. Bolivia is mestizo in essence and by a large proportion of our population. We are proud of our heritage. We embrace western civilization/culture, are in a majority Christian by choice and as such, we need to preserve our buildings. However, recently, the demagogue and populist government of evo has embarked in the construction of a humongous ugly building that destroys downtown La Paz scenery … just to please his delusional ego. Thus, investing in our heritage, even under this hectic regime, it is rewarding! LA PAZ – Bolivia’s National Museum of Art inaugurated on Tuesday an additional exhibition space in its Spanish colonial building, restored with the help of Spain as an example of the two countries working together to recover monuments of their common heritage. Morales thanked the Spanish ambassador to Bolivia, Enrique Ojeda, for the aid of the Spanish International Cooperation Agency (AECID) on projects like this. The restored space was to be called Villa de Paris, after the name of a store that was in this building, but during the event it was proposed that it should definitively be called “Taypi Qhatu,” an Aymara Indian expression referring to a market, since in pre-Columbian times it was a place where fish brought from Lake Titicaca were sold. The museum and the Cultural Foundation of the Central Bank of Bolivia, with the support of AECID, has restored this part of the building, which is a mix of colonial and post-colonial styles, the latter beginning with Bolivian independence, with its incorporation of mestizo Baroque. AECID contributed 44 percent of the funding, with 180,000 euros (some $220,000) to a second phase of the project in order to reincorporate into the museum space that was previously occupied by stores and a restaurant, and which is still occupied by a school. The museum occupies a colonial mansion built in 1760 and exhibits works of art from pre-Columbian times to the present day, many of them paintings. 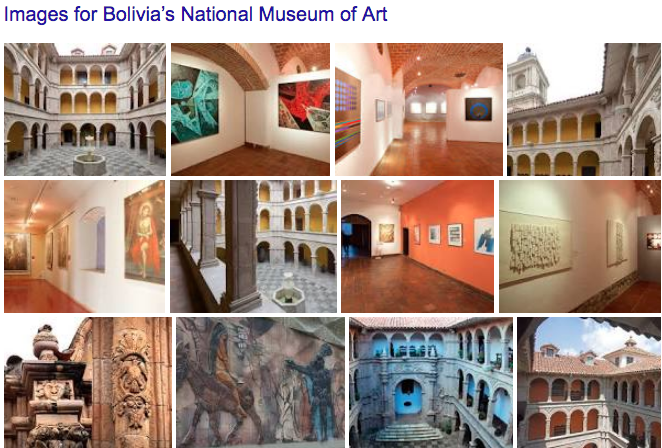 This entry was posted in Art, Bolivia, Tourism and tagged baroque and mestizo, Bolivian heritage, history. Bookmark the permalink.